Don´t Be A Victim - How To Avoid 18 Most Dangerous Mistakes! Did You Know That A Year From Now, 9 Out Of The 10 Internet Marketers You Know Will Be Out Of Business? Read The Exclusive Report Below And Save Your Business From Being A Part Of A Morbid Statistic! "Don't Be A Victim - How To Avoid The 18 Most Dangerous Internet Marketing Mistakes That Can Kill Your Business!" 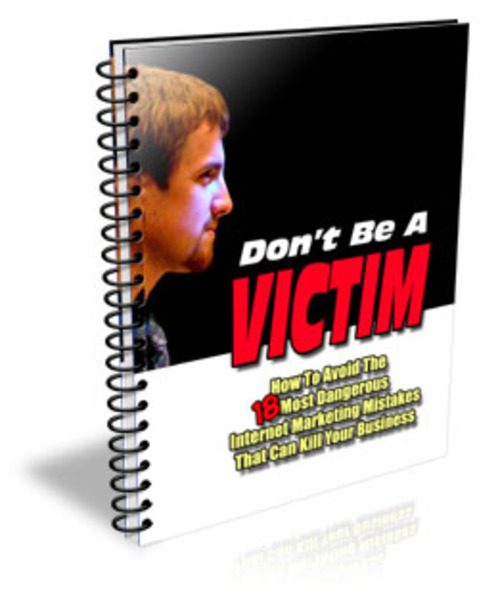 "Don't Be A Victim" is a comprehensive eBook that discusses the 18 most fatal Internet marketing mistakes that, if committed, will bring your online business to its knees. If left unchecked, any of these mistakes can bury your online enterprise so swiftly that you won't have the time to recover. * Did you know that a simple mistake in web design can render your online business absolutely useless? This mistake seems so simple, but its consequences are humongous! * Did you know that a wrong step in managing your finances will set you back a few years in arrears? * Did you know that there is one vital method essential for the operation of any online business that many business owners overlook? This neglect reduces the venture's profit by as much as 800! * Did you know that there is one essential component needed so that your marketing campaigns will click? Without this essential component, nothing will distinguish you from the crowd. * Did you know that there is one pre-operational ingredient for the success of your online business? People often forget about this, resulting in an enterprise that lacks focus and direction. * Do you know that two seemingly innocent marketing strategies that totally piss off your prospects? You may think that you're pleasing them and that you're delivering your points well, but your prospects are already preparing to dump you and any offer you will make. * Did you know that one addition to your marketing plan can give life to your business and make it sustainable for 8 years, on the average? * Did you know that there is one visual technique that may seem to win customers, but in reality, actually turns them away? I'd say 60 of online businessmen are making this mistake! These are but a few of what you will find inside the pages of Don't Be A Victim! There are 18 mistakes that are discussed, as well as countless ways by which you can avoid these perilous errors! -Internet marketing is NOT newbie-friendly. 2. Mistake No. 1: "Spend? I Don't Have To Spend A Dime!" 6. Mistake No. 5: Work? What Work? 8. Mistake No. 7: "Game Plans Are For Noobs!"